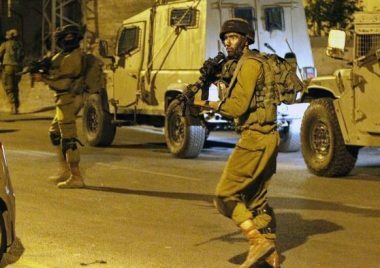 Israeli soldiers invaded, on Thursday at dawn, Hebron city in the southern part of the occupied West Bank, searched many homes and attacked several Palestinians before abducting one. Media sources in Hebron said the soldiers abducted Abed Ahmad Abu Sneina, after storming and ransacking his home in the city. They added that the soldiers also searched many homes in the city, and assaulted several Palestinians, causing cuts and bruises. Owners of two of the invaded homes have been identified as Mohammad Khalil Zama’ra and Zohdi Sharabati. The soldiers also installed many roadblocks, especially on roads leading to communities south of Hebron, and the main entrances of various nearby villages and towns.